In the early spring, here on our small New Hampshire farm, we spend a lot of time by the the sap pan. We boil and boil and sometimes burn and burn, which makes a farmer want to skip the sap season altogether, and go directly to greenhouse season. Of course, we would miss gathering sap in the snow with the horses, and lighting the first sap fire, and making sap tea, and the clouds of sweet steam, and the magical maple syrup. We wouldn't miss, however, the cold sap trickling or flooding down our boots when we've waited a little too long to empty our overflowing sap buckets, or wrestling with wet wood and a slow fire, or having to take a grinder to the sap pan because we've burned it so badly. It can take nearly as long to clean a burned sap pan as it does to make a gallon of maple syrup, which is quite a long time. But all this is part of sap season, too, and maybe we would miss it. The syrup is that much sweeter for all the work and trouble we've taken with it. Recently, we had the chance to wash off the soot and leave the pan (with lots and lots of sap to make sure we didn't burn it again!). We had an invitation from our friends to their house for a Passover Seder, the first Seder we'd ever been to. The Seder is a recounting of the enslavement of the Israelites in Egypt, and the exodus to a new land of freedom. It is also a celebration of spring, and new life, and new hope. It was a beautiful evening, rich with history and community, with singing and with ritual. We dipped parsley into salt water to represent tears, and sampled horseradish to remind us of harshness and strength, and ate matzoh to represent the unleavened bread the Israelites carried on their journey when there wasn't time for the bread to rise. We had many blessings too, over wine or grape juice, as well as a delicious meal. Best of all, we basked in the sense of family and friendship, of compassion for all who are oppressed, and of the hope for liberation for all. We came away feeling full and grateful, and the next day we came back to our (unburnt!) sap pan. Certainly, tending a sap pan is not enslavement, though it does feel rather binding at times, as we boil for twelve hour stretches and stay up until the wee hours tending the fire. The Seder was a wonderful reminder that we've undertaken this maple syrup project, and this whole farming project, by choice and in freedom. The Passover Seder is a perfect celebration for a farmer. First of all, farmers love to recount the plagues: floods in June; hail in July; broken down hayloaders in August; potato beetles, cabbage moths, and squash bugs in September; blight and in pestilence in October, woodchuck and deer all season long. Secondly, farmers love to dream of spring, and new beginnings, just as the Seder celebration does. There's no more hopeful sight than tiny, just germinated, vibrantly green lettuce or scallions. Spring is a time of potential and possibilities; no big farming disasters have happened yet, and we can vividly imagine the rest of the season: fertile soil, plenty of sunshine, an inch of gentle rain a week, vigorous growth of crops (but never weeds! ), and abundant harvests. Thirdly, and perhaps most importantly, there is a celebration of freedom, both in farming and in the Seder. Vandana Shiva, scholar, environmental activist, and food sovereignty advocate, has worked tirelessly, in India and globally, against agricultural industrialization and the resulting monoculture cropping, heavy chemical pesticide use, genetic engineering of crops, and the corporate ownership of seeds. “Seed freedom” is essential for farming, just as human freedom is essential for our lives. Perhaps farming is not the only way to be free, but it is one of the ways, and we celebrate that freedom in the Seder. We are free to complain. Free to rejoice. Free to work. Free to eat. Free to walk, and talk, and love each other. 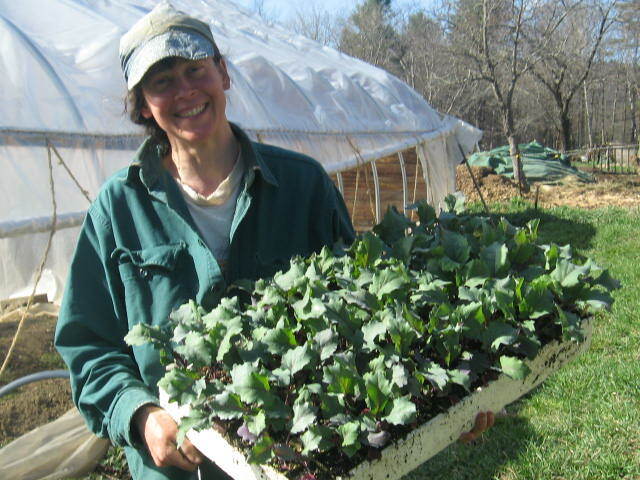 Farm Talk, by Kim Peavey, is a monthly farming and sustainability column, originally published in Keene NH's Monadnock Shopper News, as part of the "Green Monadnock" series. 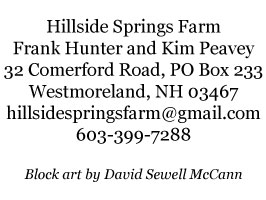 Kim farms and writes from southwestern New Hampshire. She and her family, as well as two teams of draft horses, grow vegetables biodynamically for 100 local families through a CSA garden. 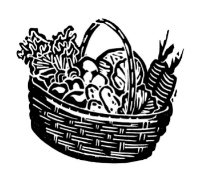 Kim has published essays and poetry in the Small Farmer’s Journal; The Natural Farmer; Local Banquet; Image: Art, Faith, Mystery; Friends Journal; Renewal; Mothering Magazine; Lilipoh (on-line version), and elsewhere. See Kim's Writing for more.